After Dave and I hiked the Swan Crest last month I needed another fix. So I sent an email out to some friends and suggested we do a Full Moon Hike to Stuart Peak (18 mile round trip hike). So, Dave, and this cool lady Kerry Kienberger (a friend of Dave's), and I left from the main Rattlesnake parking lot at 4:30pm on Friday. Just as we were leaving Mike Neilsen (a friend from the Thursday night bike crew) had just pulled up. He and three other guys (Doug Miller, Mike Peterson, and Bob Hughes) were planning on biking to the wilderness boundary and hiking the last two miles to the peak. We left, but were looking forward to seeing them on the trail at some point. Dave set a perfect pace. Besides stopping to put layers on and off - we kept truckin' up the mtn at a great clip. When we were closer to the top and past the wilderness boundary we turned around to see the sun setting over Missoula. You could really only turn for a couple of seconds since you had to keep your eyes on your footing in the snow. Just a little while later we rounded a corner and... bam! There was the big beautiful moon we had been waiting to see - the headliner for the night. Near to the top of Stuart Peak we looked down from the ridge and saw twin lakes. 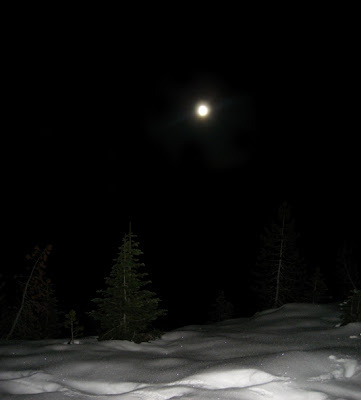 They were lit up from the moon and looked as if they had a thin layer of ice already. On the last push to the top Dave followed an elk track, which was quite nice since the snow had drifted and was a little deep in places. It was so bright up on the top and I felt so lucky to have these two great companions to share the night with. The sky was lit up by the moonlight and you could see tons of peaks and valleys from that vantage point. Stuart peak sits at about 7900 ft, and we had started at about 3700 ft in the parking lot. It was well worth the trip! I felt like I was the king of the world! Once we got out of the snow (about 2 miles down from the peak Kerry and Dave changed their socks. When we stopped to chat with the biker boys I had added gaiters, and they kept in the warmth nicely. It was just cold enough out for me to consider the benefits vs the hassle of changing at that point, but I decided I was really quite comfortable in my slightly damp socks with my gaiters. My socks were completely dried out by the time we hit the parking lot. It took us about 6 hours to do the roundtrip, and once back in the parking lot Doug Miller had the fire all started up for us! He and the rest of the bikers were there cooking brauts and having a beer. Since they didn't have any tofu brauts - I skipped the cookout, but I warmed up nice and toasty by the fire and compared adventures with the other group. I let Skagit out of the car immediately. She had been waiting for me to get back. She ran around like a crazy dog tipping over beers, jumping up on everyone, sticking her head in chip bags, and finally she singed her fur on the fire ring...So, unfortunately, I had to put her back in the car. Skagit and I got out of there around midnight and drove to Big Sky Lake. I wanted to wake up at the lake with Jeff among the pine trees. When we arrived at 1:15am, he had the light on for us.